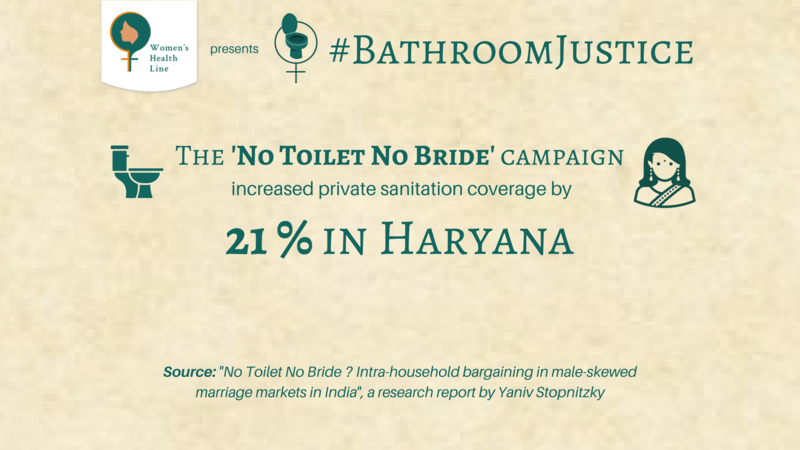 “Swachh Bharat” and women’s sanitation: Can the “honour” rhetoric bring about Bathroom Justice? In July 2017, a District Magistrate in Aurangabad, Bihar, was reported to have told a group of people gathered for a cleanliness drive that those who cannot afford to build toilets should sell their wives. Although it may sound as shocking to most people, the DM’s crass remark hints at a dangerous mindset promoted by the gendered rhetoric of a campaign run under the government’s Swachh Bharat Mission that appeals to the male members of the society to build toilets in order to protect the honour and modesty of their women. For instance, an ad featuring Vidya Balan at a wedding gained immense popularity during the initial stages of the Swachh Bharat Mission. As the young bride lifts her ghoonghat to take a sip of water, she is told by her in-laws to quickly cover her face. When Balan notices this, she asks where the bathroom is as the bride needed to use it. She is informed by an elderly woman that they don’t have a bathroom in the house, and the bride will have to go in the open. Balan crisply retorts that the bride better let her ghoonghat down as there was no dignity in peeing in the open. The series of ads took the shape of Swachh Bharat’s “No Toilet, No Bride” campaign that exhorted young men to build toilets in their house if they wanted to bring a bride home. In fact, the current theme of most behaviour-change campaigns from the government seem to focus on either the modesty of women, or on the often-aggressive shaming of the defaulters of open defecation. The promotions related to Swachh Bharat usually consider women’s privacy and security needs as the main motivation for building. In fact, most of the ads for Swachh Bharat’s sanitation campaigns depict a male – most often, a brother, a husband, or a male sarpanch – ensuring the safety and honour of the women and children who are shown to be his responsibility. While this approach may have led to immediate success as it appeals to emotions, it has also resulted in unique community-specific problems. Laying undue stress on the honour of women is short-sighted as it ultimately promotes regressive stereotypes regarding women. What became evident from the DM’s comments is that for a vast section of patriarchal society, these representations have made it seem that people who do not have access to toilets – for one reason or another – do not have the right to privacy and dignity. By appealing to men to build toilets to preserve the dignity of their women, the campaign is exploiting the prevailing patriarchal mindset that sees men as providers and protectors of women. Such campaigns give strength to notions of purdah, and pose potential threat to women’s mobility and agency. In conservative parts of India, a young and married woman is seldom allowed to leave the house. By selling the idea to the men and elderly women of the house that having a toilet at home will preserve the dignity of their daughter-in-law and daughters as they will no longer have to venture out of the house, the campaign seems to suggest that it is acceptable and even recommended to keep women home in order to preserve their modesty. Furthermore, representations of women as weak, passive and in constant need of protection, is in fact likely to bring more harm to the larger discourse on gender equality as it overlooks women’s desire to claim equal rights, freedom and mobility. Swachh Bharat’s campaign can only be successful if it persuades all members of the society to use toilets. But by targeting young women and children, the campaign leaves out healthy young men, who are the most likely defaulters when it comes to open defecation. It has been observed that young men continue to urinate in the open even after having toilets at home. Such campaigns can potentially backfire if they lead to promotion of toilets as a commodity meant mainly for use by young women, the elderly, and the infirm members of the society. It may reinforce the idea that defecating or urinating in the open is more “manly”. Additionally, it sends out the wrong kind of message as it suggests that it is acceptable for men to defecate in the open as they do not have to worry about their dignity, unlike women. In doing so, it is belying the basic tenet on which all sanitation programmes must rely on – that is, the basic human rights framework, which by default incorporates dignity and equality for both men and women. Encouraging in-home toilets is not enough for gender equality. After all, the lowest-income groups of women and girls have to stay out all day in order to earn their livelihood. The campaign seems to leave out the women who are constantly in public domain. This could be attributed to the presumption that there are fewer women in public spaces. The patent lack of emphasis on public toilets to ensure women’s mobility seems to suggest that women are not expected to leave the house at all. Most Swachh Bharat communication fails to address the menstrual health and sanitation needs of women, which are so important for a holistic view of women’s health and have so often been overlooked by previous sanitation programmes. Swachh Bharat Mission makes no improvement over its predecessors with regard to women’s menstrual health, and by appealing only to women’s modesty and security it provides a shallow view of women’s sanitary needs. A vital part of the Swachh Bharat campaign is identifying women as local leaders and empowering them to bring changes in the sanitary conditions of their own communities. For example, a May 2017 Swachh Bharat ad film by Astral Pipes shows a group of women taunting and shaming men of the village who had gone out to answer the nature’s call in the open, as a role reversal to what these women go through when they have to defecate in the open. It aims to drive home the point that defecating in the open leaves individuals vulnerable to assault, trending the hashtag that right to proper sanitation is #EveryWomansRight. They further appeal to the men's sense of honour to protect them by building in-home toilets. This representation of women as taking responsibility and openly challenging the men presents a fleeting picture of empowerment. But again, appealing to men's sense of honour to protect them by building in-home toilets takes away their agency and puts them back into the societal mould of fragile beings in need of protection. A glimmer of hope comes in the form of an ad that shows Anushka Sharma urging women to actively participate in telling off men for defecating in the open. It seems to work as an important step in making women a part of social movement. However, the success of this initiative remains speculative as participation in promoting sanitation may not necessarily lead to women’s empowerment. After all, it is a common belief that household cleanliness falls within the purview of domestic duties that the woman of the house alone is responsible for, and the ad seems to simply play on that stereotype. A successful campaign for women’s sanitation should recognize that lack of proper sanitation facilities for women do not simply pose a threat to women’s safety, but also undermine the social participation and economic contribution made by women by posing a danger to their health. It should be spelled out that while access to proper sanitation facilities is everybody’s right – not just #EveryWomansRight – as it ensures good health; for women and girls it is also an issue of safety, practicality, and equal participation in society.